On this date in 1943 in Lisbon, delegates of Italian King Victor Em­man­uel III met with the head of neu­tral Portu­gal to explore stra­tegies for ex­tracting Italy from the war. The Crown had begun searching for an exit as early as late 1942. After Allied landings in Axis-occu­pied North Africa in Novem­ber 1942 (Opera­tion Torch), the Ital­ian high com­mand approached the British via Switzer­land the next month. 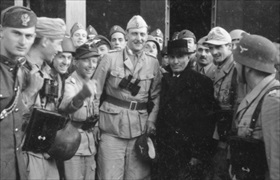 With the approval of Fascist dic­ta­tor Benito Mus­so­lini (1883–1945), a third group com­prising moderate Fascist party mem­bers pro­posed an armis­tice only to be rebuffed by the Allies before and again after the July 10, 1943, Allied landings in Italian Sicily (Operation Husky). In between the two signings, Ger­man com­man­dos under Waffen-SS Captain Otto Skor­zeny engi­neered a high-risk glider rescue that sprang a sui­cidal Mus­so­lini from house arrest in the Hotel Campo Impera­tore on Gran Sasso moun­tain, high in Italy’s Apen­nines, on Septem­ber 12, 1943. It was a pro­pa­gan­da coup for the Nazis, who flew Musso­lini to meet Hitler at his Rasten­burg head­quarters in East Prussia, the Wolfs­schanze, then back to German-occupied Northern Italy, where the Duce was installed as puppet ruler of a second (and last) incar­na­tion of a Fascist Italian state, the Repub­blica Sociale Itali­ana (Italian Social Republic), informally known as the Salò Republic, named after its capital. 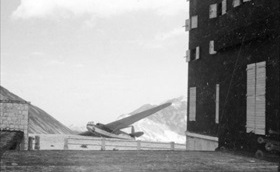 Left: The isolated alpine ski resort Campo Impera­tore Hotel in 1943, where deposed dicta­tor Benito Mus­so­lini was even­tually incar­cerated. Mus­so­lini’s Axis part­ner, Adolf Hitler, claimed that he would not let “Italy’s greatest son” down in his hour of need. His “old ally and dear friend” had to be rescued. The rescue was the last of Hitler’s spectacular gambles to bear fruit. 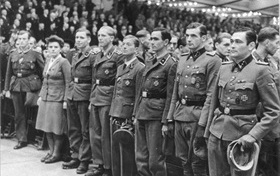 Left: Otto Skorzeny (center, dangling binoculars), field com­mander for Opera­tion Oak (Unter­nehmen Eiche) with the lib­er­ated Mus­so­lini, Septem­ber 12, 1943. The high-risk opera­tion saved Mus­so­lini from being turned over to the Allies under the terms of the armis­tice and cata­pulted the talented com­mando leader to world­wide fame. Skor­zeny received a pro­mo­tion to Sturm­bann­fuehrer, a Nazi Party para­military rank equi­va­lent to major, and was awarded the Knight’s Cross of the Iron Cross. Right: From prior reconnaissance of the site, Skor­zeny knew that only a light air­craft with short take­off and landing capa­bili­ties had a chance of getting Mus­so­lini off the moun­tain, so it was decided to land a Fieseler Storch (“Stork”) spotter plane on the un­even plateau. 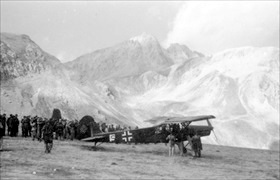 On take­off with Mus­so­lini, Skor­zeny, and the pilot on board, the Storch toppled over the edge of the moun­tain into the valley below. A hun­dred feet from its doom on the valley floor, the air­craft corrected itself. 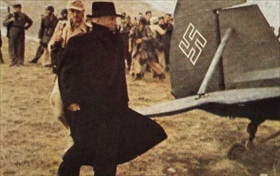 Mus­so­lini trans­ferred to a larger Heinkel and was eventually flown to the Hitler’s East Prussia headquarters. 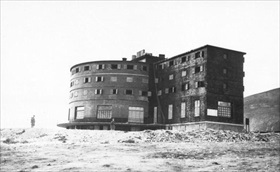 Left: Mussolini departed the Campo Impera­tore Hotel for the Storch wearing a heavy coat and heavy ski boots. His rescue was one of the most famous com­mando opera­tions of war, and it shocked the Allies. Eleven days after his res­cue, Mus­so­lini returned to Ger­man-occupied Italy, where he was installed as the titular head of the puppet Salò Republic. Right: Skorzeny’s successful exploit pro­duced a rare late-war pub­lic rela­tions blip to sagging Axis for­tunes, for it keep at least the appear­ance that Italy was still in the war on the Axis side. On Octo­ber 3, 1943, Nazi Ger­many’s Thanks­giving Day, Ber­liners gathered in the Sport Palace to cheer the brave glider-borne raiding party that had extracted the deposed dictator from the hands of his enemies.